Every child should have the opportunity to till the soil, experience growth from seedlings, and understand firsthand the essential role of soil and plants in human survival. 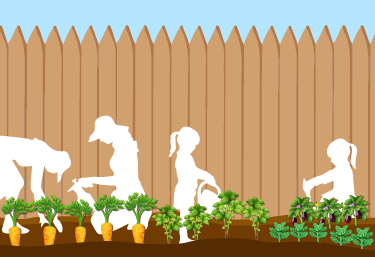 School gardens are plots of land on school grounds that are created by children for teaching and learning opportunities about the importance of growing and eating healthy food. School gardens provide seasonal seeding, plant tending, harvesting, care of small livestock such as chickens, and culinary possibilities. Students use math to calculate square footage and soil depth, cost of materials and plant adjacencies. Students use measurement in plotting the gardens, calculating harvest, and mixing ingredients in new recipes. Plant and site selection share architecture, landscape architecture and design practices. School gardens offer integrated opportunities for learning about photosynthesis and the energy and water cycles. 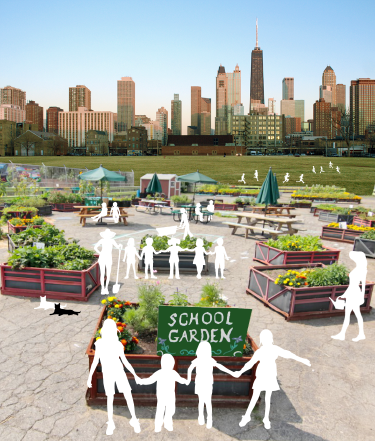 Every school should have a school garden! Library of Congress’s History of School Gardens. Take a Google Earth black and white aerial photo of your school and street views into different elevations. Print these and take them with you as you walk walk around the school with your teacher. Look at where the sun shines. Look at where the ground is moist but not a collector of water. Find areas that have good views and would improve the school grounds. Look for an underutilized area of a parking lot. Using Google Scribble Maps, locate two or three different sites for a school garden. Be sure to show and record the size of each and the movement of the sun across the sky. Study and record where the site is loud and where it is noisy. Observe if water collects in any low points. Have the school and Parent Teacher Association discuss the best location of the school garden. Take a Google Earth black and white aerial photo of your school and views into different elevations. 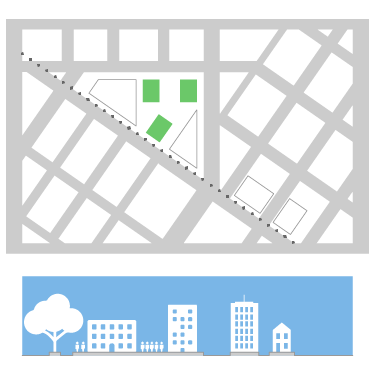 Do a Site Analysis for at least three different locations. Analyze and evaluate all three locations! Once you have located the site or sites for the school garden, it’s time to organize a list of what you will need to get started. In getting organized, you will need help. Find a garden leader or manager and helpers. Getting teachers, parents and community members involved broadens support and expertise. Looking at the Growing Vegetables Journey, you can find a list of tools necessary for working the soil and readying it for planting. Consider both edging materials for the garden (raised beds, fencing to keep the rabbits out, or soil enhancements). 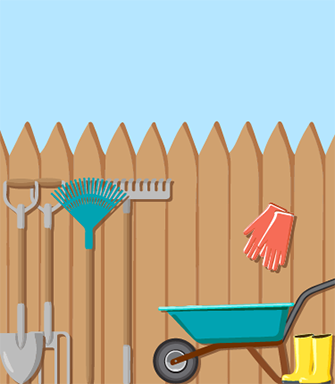 A storage shed or gardeners hut is very helpful to store the tools and buckets. You will need a water source and hoses; a soil testing kit ensures that the soil has proper pH and nitrate reading to grow healthy plants. Make a list of what you will need and who will provide it. What will you plant? First, find out what grows in your community. Ask gardeners, plant stores, and teachers. Make four five drawings of fruit or vegetable plants in different stages of development. Draw the seed, seedling, growing plant, flowering plant, fruit and seed heads. Note which part of the plant is harvestable- leaves, stems, roots, or seeds! Dimension how much room plants need to flourish in plan and elevation. Make notes about how much sun and water each plant needs and what the growing time is from seeding to harvest. 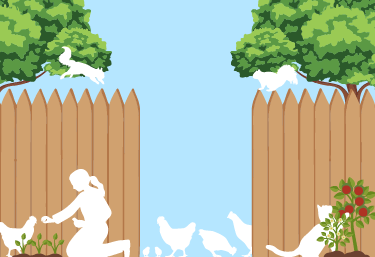 Outdoor animal gardens introduce both wild and domesticated animals to children. Natural habitats with ground cover, bushes, flowers and trees attract squirrels, butterflies, birds, and rabbits. Some cities allow school gardens to have a chicken hutch and some even goats! Find out what your district allows and encourage the children to create habitats for the animals. Using gridded paper, measure and draw out your garden area. Start small and then as you have success you can enlarge your garden area. You can use string and wooden stakes and a hammer to block out the plot or plots outside the classroom. If it is a grassy area, you will need to remove the sod and loosen or break up the soil. Building raised beds and filling them with fresh soil removes the need to dig. 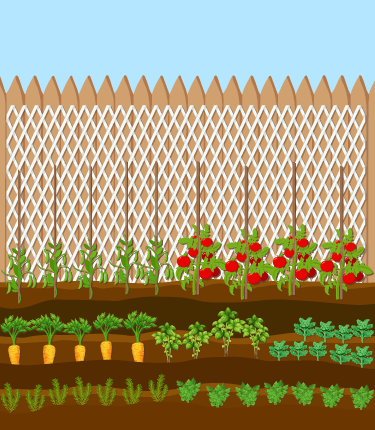 Using strings divide the garden into areas for growing rows of fast growing leafy plants, and taller rooted vegetables. Make sure you plant the taller plants at the back to allow the sunshine to reach the lower plants in the front. Each plant has a different growing diameter and height. Make drawings of mature plants at harvesting time and work backwards. Mark their height and circumference and draw a section across the garden noting different fruits and vegetables and the area in plan and elevation that they need to grow. Be sure to include a compost area! Composting old plants creates food for new plants, keeps the earth moist and helps to aerate the soil. Draw and label all the parts of your garden plot in plan and elevation. When chances of frost pass, you can plant most seeds. Be sure to use a ruler to separate the seeds to allow the plants to spread and grow. Vegetables like squash and cucumber and pumpkins take up a lot of ground space. Beans need a bean tower to climb! Research plant communities and plant some friendly flowering plants in with your vegetables and fruits. Draw your garden plot with seedlings with the area for each plant marked out. Do you have a green thumb? In addition to plant care, gardeners need to watch over the soil. Is it too hard, too dry or too wet? Does the plant have enough light? Does it have enough room to grow? What worms and insects are good for the garden? What insects eat or attack the plants? Almost always gardens are invaded by weeds and other unnecessary greens that will need removal. Careful weeding saves nutrients for vegetables and plants. Take pictures of your garden each week for ten weeks. 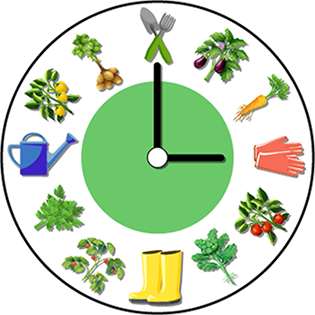 Time to harvest your garden! Your plants will be ready for harvest at different times. 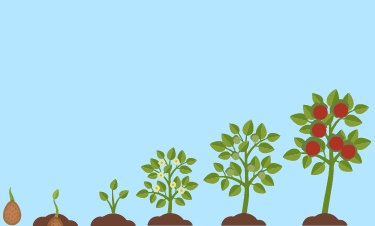 Fast growing plants like arugula and baby lettuce may be as fast as two weeks. Tomatoes take two months! 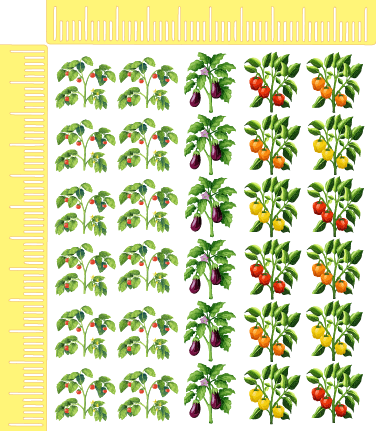 Make a chart of everything you have planted, and time from planting to harvesting to plan your collection. From ‘plot to pot’! It’s time to harvest! School gardens can provide healthy lunches for teachers and students. Take pictures of your plant products and explore different recipes such as fruit smoothies, salads, and soups. Before eating, all vegetables should be washed and cleaned. Find or create a recipe for a soup or salad. One hundred years ago there were how many school gardens in each state? In the 21st century, it is estimated that how many schools have school gardens according to the library of Congress History of School Gardens? How do school gardens introduce science subjects? How can students learn language arts in a school garden? How can students learn math in a school garden? Eco Way to Keep Grubs & Pests Away!